Sottotitolo / Subtitle: Relax! You can learn Italian now! “Speak Italian magically” è un corso d’italiano per principianti. Col corso si potrà: * Viaggiare in Italia e visitare le più belle città della Penisola * Rilassarsi imparando sempre nuove parole e nuove espressioni italiane comuni * Divertirsi e vivere magiche avventure in Italia e con gli Italiani * Iniziare a pensare italiano * Rinfrescare l’italiano. 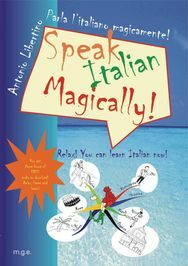 “Speak Italian magically” is an Italian course for absolute beginners. You will: * Travel to Italy and visit some of the most beautiful Italian cities * Relax while learning new words and every day Italian Italian expressions * Have fun with ten magic adventures into Italy and Italian, where the main carachter is YOU * Begin to think in Italian * Refresh Italian you might have learned before. Antonio Libertino è nato nel 1976 a Tropea, dove vive e lavora come insegnante d’Italiano per stranieri. Laureato in Giurisprudenza nel 2000 all’Università di Messina, ha conseguito il diploma DITALS (didattica dell’Italiano a stranieri) nel 2005. Per la Meligrana ha pubblicato: “Impariamo l’Italiano a Tropea” (2007 - book / ebook); “I segreti della lingua italiana per stranieri” (2009 - book / ebook); “Speak Italian Magically!” (2011 - book / ebook); “Awaken Your English!” (2012 - book / ebook); “Il Blog di Awaken Your English” (2012 - ebook). Antonio Libertino was born in 1976 in Tropea, where he lives and works as an Italian teacher for foreigners. Graduated in Law at the Univerisity of Messina in 2000, he earned the Ditals (certificate for teaching Italian to foreigners issued by the Università per stranieri di Siena) in 2006. With Meligrana he published: ““Impariamo l’Italiano a Tropea” (2007 - book / ebook); “The secrets of the Italian language” (2009 - book / ebook); “Speak Italian Magically!” (2011 - book / ebook); “Awaken Your English!” (2012 - book / ebook); “Il Blog di Awaken Your English” (2012 - ebook).